It’s a very blustery morning here in Dublin. The sky is black and the heavens are about to open. Although it’s August and it’s still very warm (for Ireland), I’m craving some comfort food. When it comes to the small comforts in my life bread is probably top of the list, well maybe mashed potatoes and bread can share the top spot. Either way I LOVE bread. This is a simple recipe that I’ve flavoured with some garlic and oregano. I’ve dried out this years crop of oregano and I have a huge supply so thought I’d add some to the bread. You can use whatever herbs you have to hand. The aroma that fills your kitchen is one to savour. Combine the flour, yeast, salt and oregano in a large bowl. Grate in the garlic. Add the water to the flour mix along with the olive oil and mix well. Turn the dough out onto a clean surface and kneed for 5 to 10 minutes. The consistency should be quite sticky. Use a little extra flour to help prevent the dough from sticking to the surface. 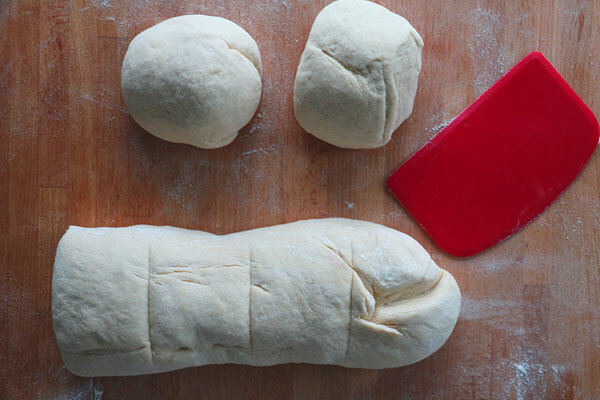 Shape the dough into your preferred shape, I’ve opted for a baguette, and place in a tray or a bowl. Cover with cling film and leave to rest for at least an hour. The dough should double in size. Tip the dough out onto a clean surface and “knock it back” with your fingers. This is knocking the air out of the dough. Reshape and leave to rest again for an hour. You can cover with a tea towel. Preheat your oven to it’s highest temperature. 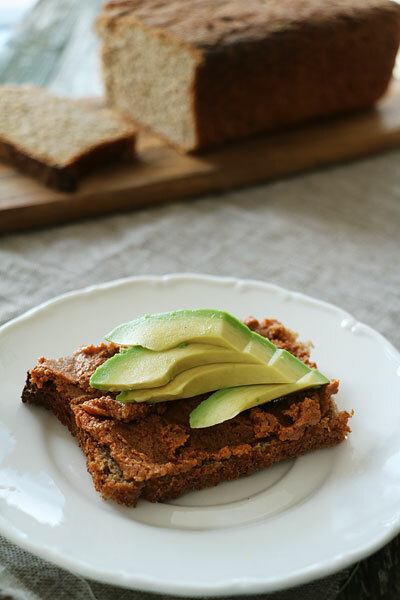 Using a sharp knife, cut through a few lines in the top of your bread. Transfer to a baking tray and cook on max temperature for 10 minutes. Then, reduce to 180° and continue to cook for another 20 minutes. When cooked the bread should make a hollow sound when tapped on the base. Allow to cool. 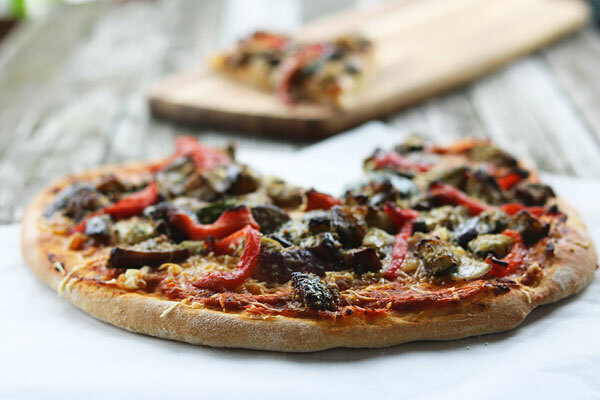 Everything in moderation they say, and I do try but when it comes to this tasty flat bread I’ve gotta’ have seconds, maybe thirds. 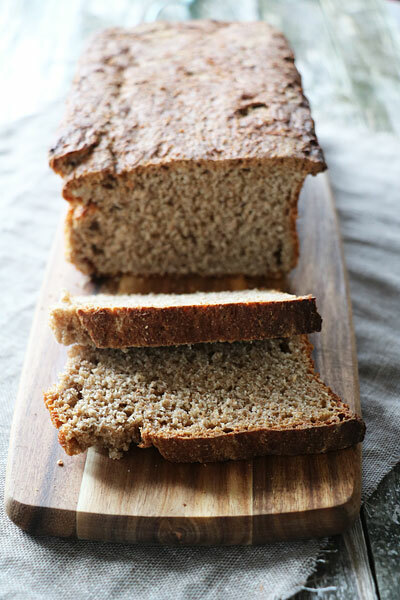 This bread is so moreish, it’s salty and chewy and has a little yeasty backnote. 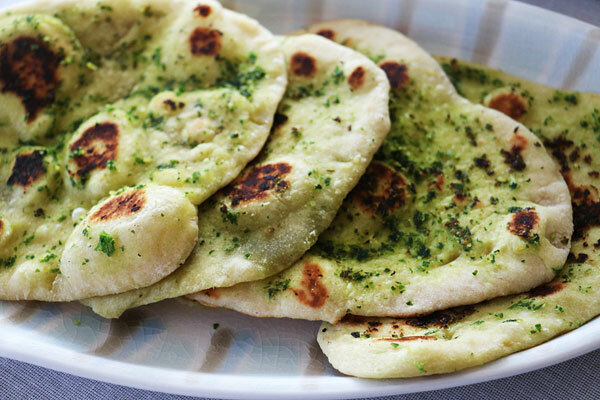 It also reminds me of the garlicky flat breads I tried in Sicily a few years back. The bread looks green because I’ve used the last of my Wild Garlic Pesto that I had in the freezer. The wild garlic pesto is super tasty but why wait until next Spring to forage for wild garlic when in the meantime you can simply whizz up some garlic cloves and olive oil in a food processor to give your bread a kick of that garlic zing! Add the flour, salt and the yeast to a large mixing bowl and mix well. Add in the butter and most of the water and mix well. Add the remaining water until all of the flour is mixed in. 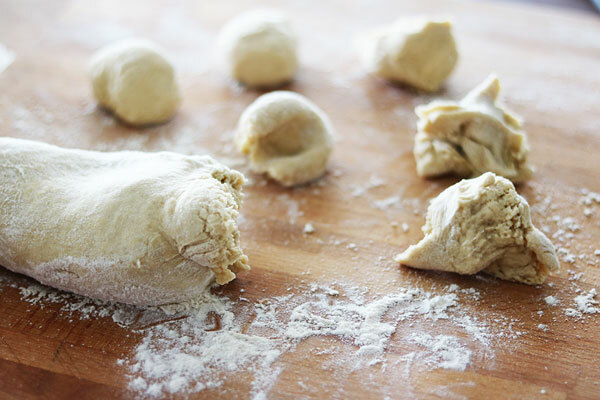 Gently pour out the dough onto a lightly flour surface and knead for 5 minutes, until the dough feels soft and silky. Return to the mixing bowl, cover and set aside for an hour. The dough should double in size. Again, gently pour the dough out onto a lightly floured surface and “knock it back” by kneading it until the air has been pushed out. Tear the dough into 12 equal balls. Heat a large frying pan and roll out each ball into flat bread and leave in a warm place to rest for 15 minutes. 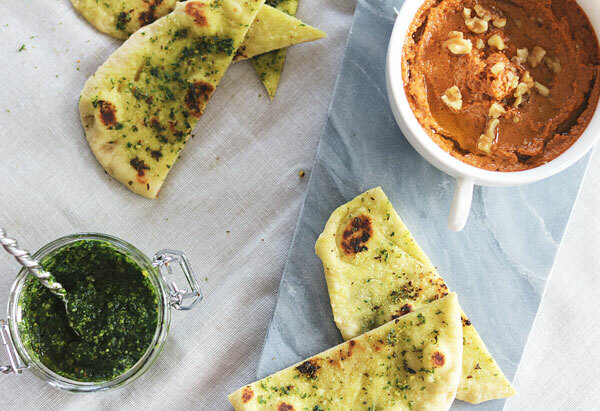 Heat a large frying pan on the stove and brush each flat bread with the wild garlic pesto. Place on the pan pesto side down. 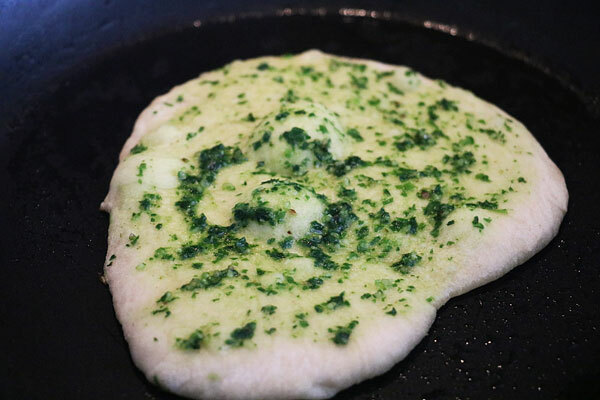 Brush the top with some more pesto and when the flat bread starts to bubble turn it over to cook on the other side. Cook each one for a couple of minutes on each side. The flat breads should be dark in colour. Remove from the pan, slice and serve with hummus or muhammara.